Grace tweets, “The bathroom sink in my 1890s Victorian is draining really slowly. What’s the best way to get things flowing again?” Glad you asked, Grace. If you’ve got really old plumbing, harsh drain chemicals can cause damage. Try a naturally biodegrading drain cleaner or this homemade remedy: Pour in a half cup of baking soda, then a whole cup of white vinegar. 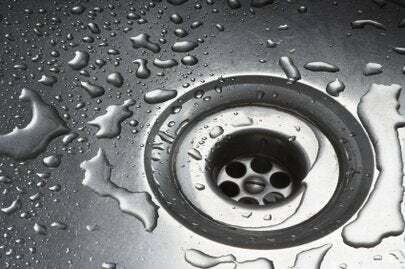 Cover the drain for five minutes and flush it with a gallon of boiling water. Some clogs call for a plunger. The key here is to create a vacuum, not just a mess. Stop up any air vents or adjoining drains, and if you’re working on the kitchen sink, you need to clamp off the dishwasher hose and seal the drain openings in the other sink basins. If it’s the bathroom sink or tub, plug the overflow opening with a wet rag. With at least a couple inches of some water in the basin, you want to plunge rapidly several times, pulling up sharply at the end to move the clog. You may need to do this several times. If plunging doesn’t clear the clog, use an auger. If your drain opening is obstructed, sometimes a coat hanger wire with a small hooked end will bring up the clog. You can also detach the trap under the sink with a plumber’s wrench in order to get at the clog or to rescue anything you’ve lost down there. Turn it through the clog, back off a little, then run it all the way through and pull the whole thing straight out of the drain. If you don’t see an improvement in drainage after all that—and especially if more than one drain is slow in your house—you should consult a plumber since the problem could be caused by blocked or improper venting of the wastewater system.